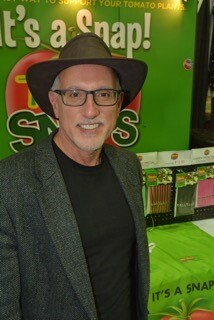 My name is Bob Deeb, as the inventor for Tomato Snaps® I wanted to share my story for the inspiration behind my versatile snap-in-place invention. The idea for Tomato Snaps® began while researching plant support systems on the market. In the midst of my research I grew frustrated in the limited variety and lack of versatility in the products that were available. While working in my garden, in the summer of 2013, I thought of a simple approach to creating support for my 40 tomato plants. My idea consisted of utilizing: webbing material, multiple clasps, and a device to connect the two. The result was a simple, practical design that solved the need that I had been seeking. I experimented with the prototype throughout my garden and I was amazed at how quickly and easily it was to wrap and snap my 40 plants to the stakes. The whole process took less than 45 minutes. As my tomato plants grew I realized how easy it was to move the straps as needed, allowing better support for my tomato plants. Tomato Snaps® became an essential tool in my garden! After seeing how easily the snaps worked for my tomato plants, I recognized that this device could be utilized by other gardeners. I found that Tomato Snaps®, aside from being practical, were unique and could be easily used as a multipurpose household tool. Often the simplest inventions make life’s everyday tasks more enjoyable, and this is one of them!